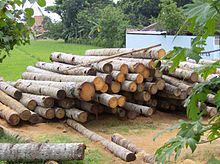 Wood has been used for thousands of years for fuel, as a construction material, for making tools and weapons, furniture and paper. More recently it emerged as a feedstock for the production of purified cellulose and its derivatives, such as cellophane and cellulose acetate. As of 2005, the growing stock of forests worldwide was about 434 billion cubic meters, 47% of which was commercial. As an abundant, carbon-neutral renewable resource, woody materials have been of intense interest as a source of renewable energy. In 1991 approximately 3.5 billion cubic meters of wood were harvested. Dominant uses were for furniture and building construction. 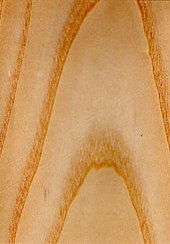 The wood of coast redwood is distinctively red. Wood is a heterogeneous, hygroscopic, cellular and anisotropic material. It consists of cells, and the cell walls are composed of micro-fibrils of cellulose (40–50%) and hemicellulose (15–25%) impregnated with lignin (15–30%). Chemical structure of lignin, which comprises about 25% of wood dry matter and is responsible for many of its properties. The Saitta House, Dyker Heights, Brooklyn, New York built in 1899 is made of and decorated in wood. The churches of Kizhi, Russia are among a handful of World Heritage Sites built entirely of wood, without metal joints. See Kizhi Pogost for more details. 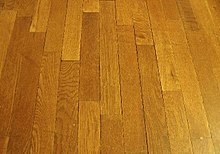 Wood can be cut into straight planks and made into a wood flooring. ^ Hickey, M.; King, C. (2001). The Cambridge Illustrated Glossary of Botanical Terms. Cambridge University Press. ^ "Global Forest Resources Assessment 2005/Food and Agriculture Organization of the United Nations" (PDF). ^ "N.B. 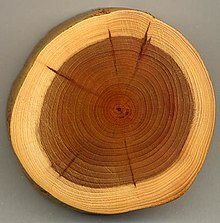 fossils show origins of wood". CBC.ca. August 12, 2011. Archived from the original on August 13, 2011. Retrieved August 12, 2011. ^ Philippe Gerrienne; et al. (August 12, 2011). 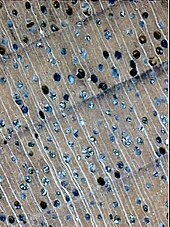 "A Simple Type of Wood in Two Early Devonian Plants". Science. 333 (6044): 837. Bibcode:2011Sci...333..837G. doi:10.1126/science.1208882. PMID 21836008. ^ Woods, Sarah. "A History of Wood from the Stone Age to the 21st Century". EcoBUILDING. A Publication of The American Institute of Architects. Archived from the original on March 29, 2017. Retrieved March 28, 2017. ^ Briffa, K.; Shishov, V.V. ; Melvin, T.M. ; Vaganov, E.A. ; Grudd, H.; Hantemirov (2008). "Trends in recent temperature and radial tree growth spanning 2000 years across northwest Eurasia". Philosophical Transactions of the Royal Society B: Biological Sciences. 363 (1501): 2271–2284. doi:10.1098/rstb.2007.2199. PMC 2606779. 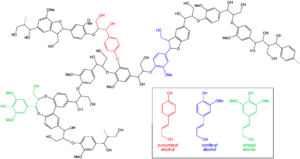 PMID 18048299. ^ a b c Record, Samuel J (1914). The Mechanical Properties of Wood. J. Wiley & Sons. p. 165. ASIN B000863N3W. ^ "Duramen" . Encyclopædia Britannica. 8 (11th ed.). 1911. p. 692. ^ "Alburnum" . Encyclopædia Britannica. 1 (11th ed.). 1911. p. 516. ^ Record, Samuel James (1914). The Mechanical Properties of Wood: Including a Discussion of the Factors Affecting the Mechanical Properties, and Methods of Timber Testing. J. Wiley & Sons, Incorporated. Archived from the original on December 11, 2017. ^ "Wood Properties Growth and Structure 2015". treetesting.com. Archived from the original on March 13, 2016. 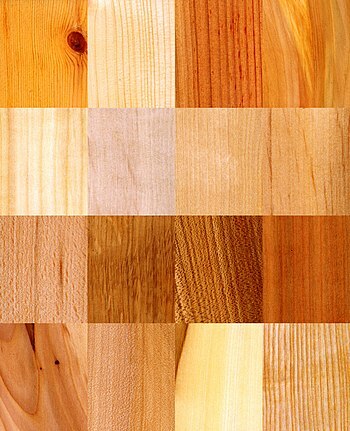 ^ "Timber Plus Toolbox, Selecting timber, Characteristics of timber, Structure of hardwoods". nationalvetcontent.edu.au. Archived from the original on August 10, 2014. ^ a b c d e Sperry, John S.; Nichols, Kirk L.; Sullivan, June E.; Eastlack, Sondra E. (1994). "Xylem Embolism in ring-porous, diffuse-porous, and coniferous trees of Northern Utah and Interior Alaska" (PDF). Ecology. 75 (6): 1736–1752. doi:10.2307/1939633. JSTOR 1939633. ^ a b Samuel James Record (1914). The mechanical properties of wood, including a discussion of the factors affecting the mechanical properties, and methods of timber testing. J. Wiley & sons, inc. pp. 44–. Archived from the original on March 15, 2017. ^ a b U.S. Department of Agriculture, Forest Products Laboratory. 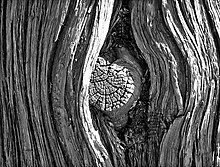 The Wood Handbook: Wood as an engineering material Archived March 15, 2007, at the Wayback Machine. General Technical Report 113. Madison, WI. ^ a b c Timell, T.E. 1986. Compression wood in gymnosperms. Springer-Verlag, Berlin. 2150 p.
^ Elliott, G.K. 1970. Wood density in conifers. Commonwealth For. Bureau, Oxford, U.K., Tech. Commun. 8. 44 p.
^ Jean-Pierre Barette; Claude Hazard et Jérôme Mayer (1996). Mémotech Bois et Matériaux Associés. Paris: Éditions Casteilla. p. 22. ISBN 978-2-7135-1645-0. ^ Mimms, Agneta; Michael J. Kuckurek; Jef A. Pyiatte; Elizabeth E. Wright (1993). Kraft Pulping. A Compilation of Notes. TAPPI Press. pp. 6–7. ISBN 978-0-89852-322-5. ^ Sterrett, Frances S. (October 12, 1994). Alternative Fuels and the Environment. CRC Press. ISBN 978-0-87371-978-0. ^ Binggeli, Corky (2013). Materials for Interior Environments. John Wiley & Sons. ISBN 978-1-118-42160-4. ^ a b "APA – The Engineered Wood Association" (PDF). apawood.org. Archived (PDF) from the original on June 27, 2006. ^ "FPInnovations" (PDF). forintek.ca. Archived from the original (PDF) on March 19, 2009. ^ Christina Bienhold; Petra Pop Ristova; Frank Wenzhöfer; Thorsten Dittmar; Antje Boetius (January 2, 2013). "How Deep-Sea Wood Falls Sustain Chemosynthetic Life". PLOS ONE. 8 (1): e53590. Bibcode:2013PLoSO...853590B. doi:10.1371/journal.pone.0053590. PMC 3534711. PMID 23301092. Hoadley, R. Bruce (2000). Understanding Wood: A Craftsman's Guide to Wood Technology. Taunton Press. ISBN 978-1-56158-358-4. This page was last edited on 16 February 2019, at 18:14 (UTC).